My skincare routine doesn’t tend to switch up very often, however its been a long time since my previous one & things have changed. If you want to read my old skincare routine you can here. 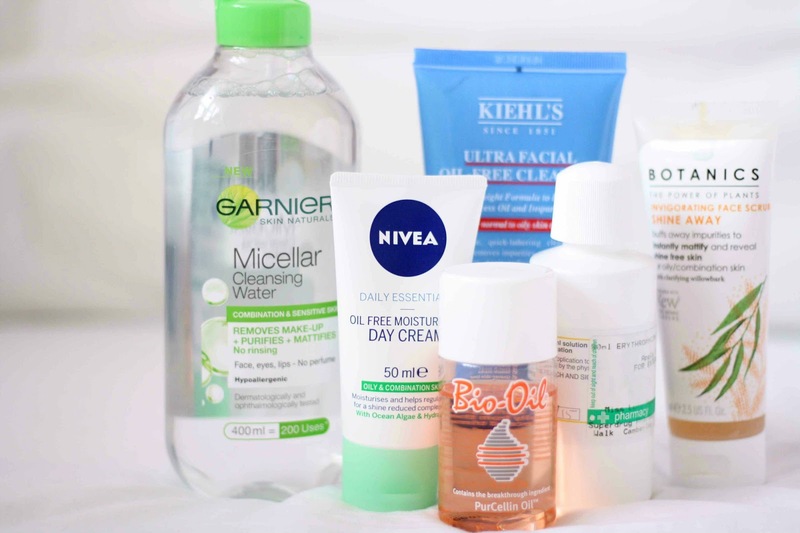 There’s a theme throughout my skincare routine; a lot is aimed at oily/combination skin. Because I have pretty oily skin. I use the Garnier Micellar water to take off my makeup, I don’t think there’s a noticeable difference between the normal Micellar water and the one aimed for oily skin; however I love this and it gets my makeup off like a dream. I have done a full review of this product, if you would like to read it, its here. I use this as my main cleanser, again its oil free to help control the oils on my skin. It isn’t a foaming cleanser, which I love and it feels refreshing on the face. You can really feel it get to work straight away and my face always feels so nice afterwards. Plus you only need the tiniest amount, so a little goes a long way. I have linked the information to this if anyone would like to look into it. This is a prescribed solution to help with spots, in specific acne. In no way shape or form do I suffer with bad acne, but I get very regular breakouts that take a long time to go away. It was making me quite insecure so I decided I’d get a prescribed drug for it. If you do suffer with bad breakouts/acne I would recommend talking to your GP about this, it has helped me. A recent discovery, because no moisturisers were working for me. Again its oil free to help control my pesky oily skin. I’ve really been enjoying this, it makes my skin feel very smooth and hydrated without making it feel greasy or oily. However it is very heavily scented, I personally don’t mind the smell but something to bear in mind if you don’t like scented skincare products. I use this to help fade my spot scars quicker, because I do get very bad scarring from spots and its super annoying. I find Bio-Oil helps make them go much quicker than if I left them to their own devices. Would highly recommend to anyone suffering with scars. I have also done a full review of this here. I really love this, I love a lot from the Botanics range. Not going to lie, this is very rough on the skin. If you like your exfoliators to be gentle and soft this isn’t for you. This is heavy going and really works there and then. When I have areas of dry flaky skin I will whip this out and rub it on. It isn’t the nicest feeling, but it just works so well. I’d recommend this if you want a quick fix for dry patches.